The brand-new the Main Museum of Los Angeles Art will open its doors on October 30—but you might notice that something seems to be… missing. 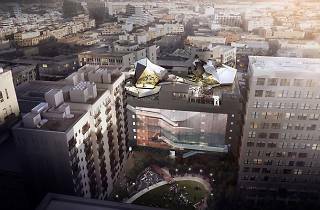 Specifically, the elaborate build-out of the museum’s Downtown L.A. home. That is why this initial opening is being dubbed the “beta” phase—as in, a beta test before the full launch. Museum director Allison Agsten told Curbed that, so far, the construction on the space, spread across the old Farmers & Merchants Bank, Hellman Building and Bankhouse Garage buildings, has been minimal. For the beta period, performance artists Suzanne Lacy and Andrea Bowers will move into studios in the Hellman Building portion to live and work on-site for 10 days. While in residence, they’ll offer discussions and workshops. An opening reception will take place at 2:30pm on October 30 to kick things off. The artists’ project is the first commissioned by the museum, entitled Performance Lessons: Suzanne Lacy Teaches Andrea Bowers Performance Art. It will explore the history of performance art, with a focus on California from 1968 to 1980. Museum-goers can drop in to check on the project and see a gallery space featuring drawings related to the performance. Once Lacy and Bowers move out, other artists will come through to work in the studio spaces. Residencies are currently scheduled for the Boyle Heights-based photographer Star Montana and conceptual artist Sid M. Dueñas. The next phase of construction on the Main Museum will take up to four years and is estimated to cost about $55 million. 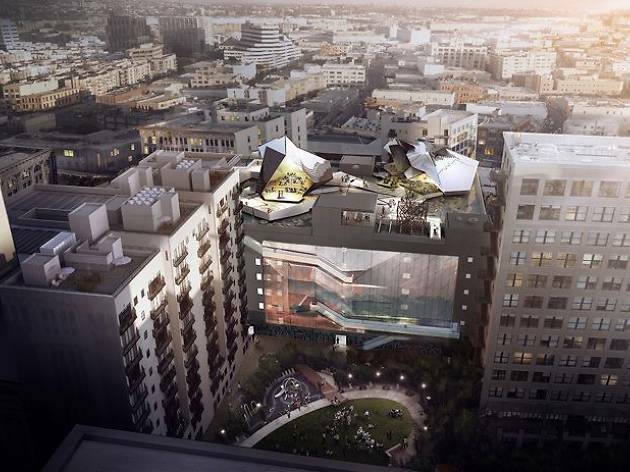 Local architect and SCI-Arc professor Tom Wiscombe’s design will create a modern 45,000-square-foot museum space with an additional 30,000-square-foot rooftop garden, an amphitheater and a restaurant cantilevered out over Main Street. Beta Main at the Main Museum of Los Angeles Art is located at 114 W 4th St in DTLA. It opens on October 30 and will be open on a project-to-project basis. During Performance Lessons, hours will be noon to 8pm daily, with a gallery space open noon to 8pm Wednesday to Saturday and noon to 5pm on Sunday.